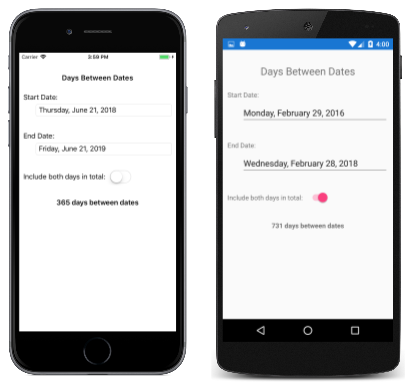 A Xamarin.Forms view that allows the user to select a date. MinimumDate of type DateTime, which defaults to the first day of the year 1900. MaximumDate of type DateTime, which defaults to the last day of the year 2100. Date of type DateTime, the selected date, which defaults to the value DateTime.Today. Format of type string, a standard or custom .NET formatting string, which defaults to "D", the long date pattern. TextColor of type Color, the color used to display the selected date, which defaults to Color.Default. FontAttributes of type FontAttributes, which defaults to FontAtributes.None. FontFamily of type string, which defaults to null. FontSize of type double, which defaults to -1.0. The DatePicker fires a DateSelected event when the user selects a date. When setting MinimumDate and MaximumDate, make sure that MinimumDate is always less than or equal to MaximumDate. Otherwise, DatePicker will raise an exception. Internally, the DatePicker ensures that Date is between MinimumDate and MaximumDate, inclusive. If MinimumDate or MaximumDate is set so that Date is not between them, DatePicker will adjust the value of Date. All eight properties are backed by BindableProperty objects, which means that they can be styled, and the properties can be targets of data bindings. The Date property has a default binding mode of BindingMode.TwoWay, which means that it can be a target of a data binding in an application that uses the Model-View-ViewModel (MVVM) architecture. In this example, all three properties are initialized to the corresponding properties in the ViewModel. Because the Date property has a binding mode of TwoWay, any new date that the user selects is automatically reflected in the ViewModel. If the DatePicker does not contain a binding on its Date property, an application should attach a handler to the DateSelected event to be informed when the user selects a new date. For information about setting font properties, see Fonts. However, this is not recommended. Depending on the setting of the Format property, selected dates might require different display widths. For example, the "D" format string causes DateTime to display dates in a long format, and "Wednesday, September 12, 2018" requires a greater display width than "Friday, May 4, 2018". Depending on the platform, this difference might cause the DateTime view to change width in layout, or for the display to be truncated. It's best to use the default HorizontalOptions setting of Fill with DatePicker, and not to use a width of Auto when putting DatePicker in a Grid cell. The DaysBetweenDates sample includes two DatePicker views on its page. 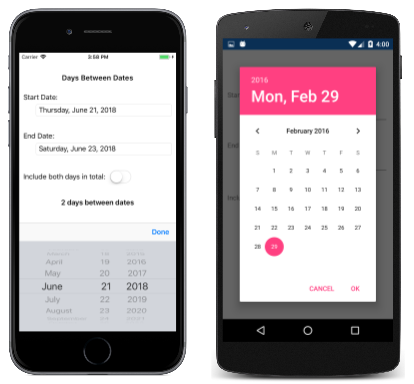 These can be used to select two dates, and the program calculates the number of days between those dates. The program doesn't change the settings of the MinimumDate and MaximumDate properties, so the two dates must be between 1900 and 2100. <Label Text="Include both days in total: "
Each DatePicker is assigned a Format property of "D" for a long date format. Notice also that the endDatePicker object has a binding that targets its MinimumDate property. The binding source is the selected Date property of the startDatePicker object. This ensures that the end date is always later than or equal to the start date. In addition to the two DatePicker objects, a Switch is labeled "Include both days in total". On Android, the DatePicker dialog can be customized by overriding the CreateDatePickerDialog method in a custom renderer. This allows, for example, additional buttons to be added to the dialog.